This slow cooker whole chicken is a rotisserie style seasoned chicken made with the help of the crock pot. It’s a super easy dinner option and the leftover chicken can be used in countless other dishes! 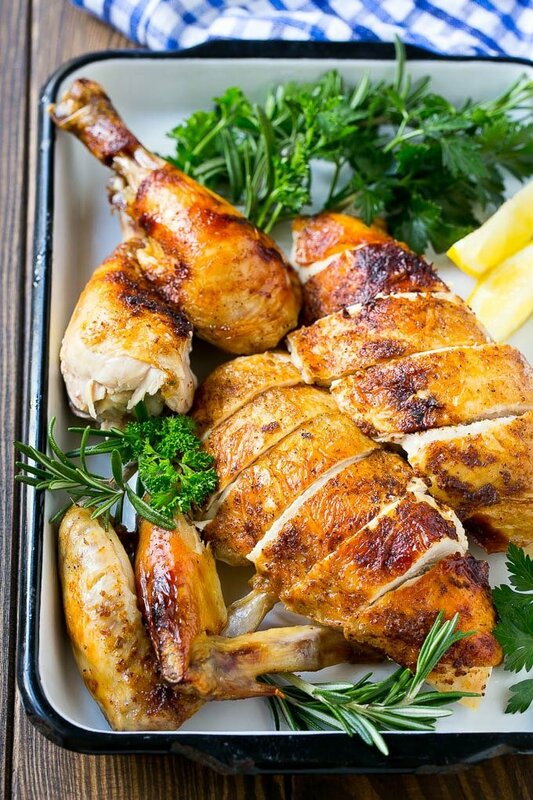 I love rotisserie chicken, but it can be pricey and is often filled with sodium and sometimes even preservatives and other questionable ingredients. This slow cooker roasted chicken has just a few minutes of prep time, you can set it in the morning and come home to have dinner waiting for you! For the longest time, every time I went to Costco I’d pick up one of their rotisserie chickens for a cheap and easy meal. Then one day I read the ingredient list, and there are some additives in those chickens that I’d rather not feed my family. This slow cooker whole chicken is SO easy to make, and you can have a fresh cooked rotisserie style chicken any time you want with more natural ingredients! 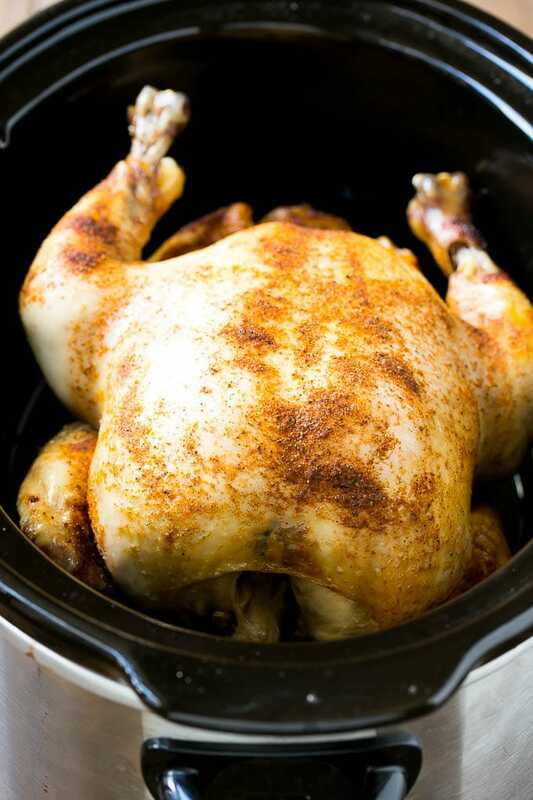 Can you cook a whole chicken in a slow cooker? Yes you can! The first step is to choose your chicken, I like to use organic whenever possible. You want to make sure that your chicken will fit inside your crock pot, I use my larger oval crock pot for this task which is big enough to accommodate almost any sized chicken. If you’re using a smaller round slow cooker, opt for a smaller bird. 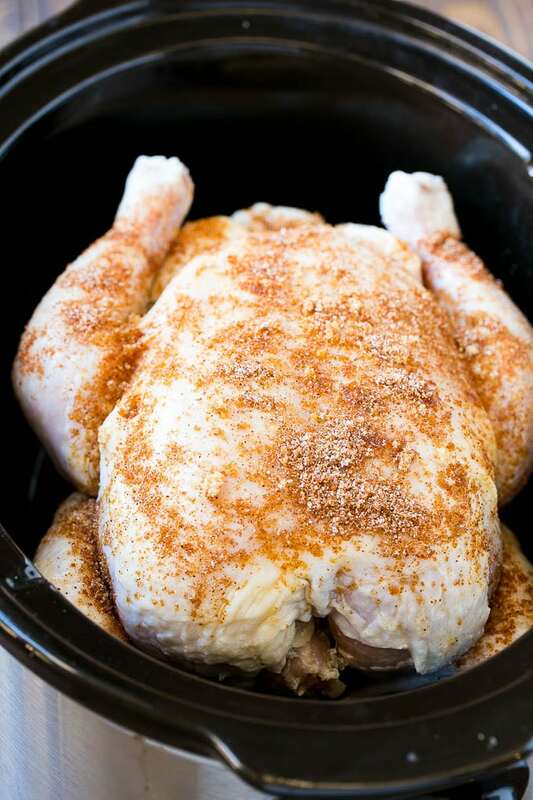 The chicken gets coated in a simple spice blend, then placed in the slow cooker atop a ring of foil. The foil acts as a rack to keep the chicken from steaming in its own juices as it cooks. It is safe to cook a whole chicken in a slow cooker, but it’s typically recommended that you cook the chicken on high heat for at least one hour for food safety purposes. This recipe calls for cooking the chicken on high heat for the entire cook time. How long will it take to cook a chicken in a slow cooker? 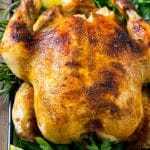 It typically takes 3-4 hours to cook a chicken on high heat in the slow cooker, and 8 hours to cook on low heat. As mentioned above, if you plan to cook your chicken on the lower heat setting, be sure to let it cook at high for one hour before you switch to low to make sure the chicken is at the correct temperature for food safety purposes. 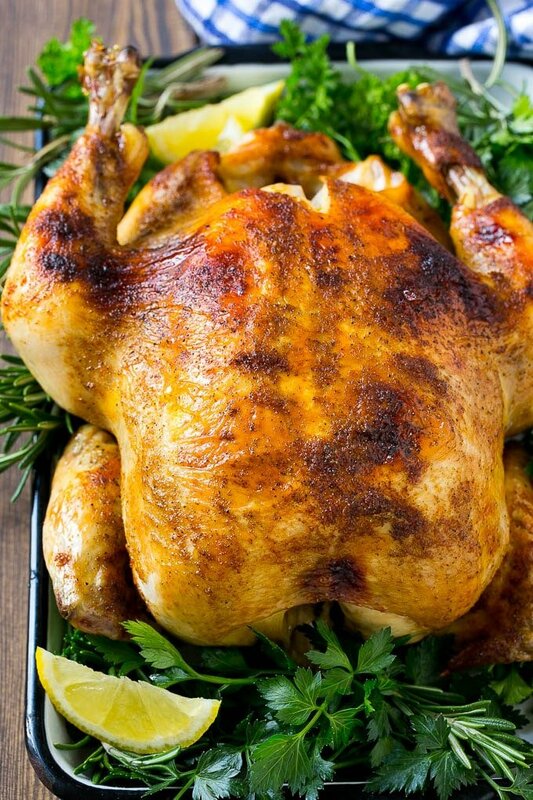 At the end of your cook time, you’ll have a juicy and flavorful bird! At this point, your slow cooker chicken is just missing one thing: that golden brown skin normally associated with rotisserie chicken. I transfer my chicken to a baking pan and broil it for about 5 minutes to get that beautiful golden brown skin that everybody loves. When I cook a 5 pound chicken for my family, we typically end up with plenty of leftovers which I use to create dinner for the next night. Once you try this slow cooker whole chicken, you’ll never want to go back to store bought rotisserie chicken again! This slow cooker whole chicken is a rotisserie style seasoned chicken made with the help of the crock pot. It's a super easy dinner option and the leftover chicken can be used in countless other dishes! In a small bowl, mix together the brown sugar, salt, pepper, garlic powder, onion powder and smoked paprika. Coat a large slow cooker with cooking spray. Roll a piece heavy duty aluminum foil into a ring shape to fit into the slow cooker as a rack. Place the chicken on top of the foil ring. Rub the spice mixture all over the chicken. Cover and cook on HIGH for 3-4 hours or until thermometer inserted into the thickest part of the thigh registers at 165 degrees or higher. Transfer the chicken to a sheet pan or baking dish and broil in the oven for 4-5 minutes or until chicken skin is brown and crispy. Serve. Nutritional facts assume calorie and fat counts for skin. If you're looking to cut calories, remove the skin before eating. Can the chicken be frozen or does it need to be completely thawed out? It should be thawed to make sure the chicken remains in the appropriate temperature during the cook time for food safety reasons.